Q. This phrase that you came up with, Black Lives Matter – it’s now being used by everyone. What has that been like, seeing this phrase that you came up with turn into the catchphrase of the movement? Q. One thing that I’ve noticed about the protests this week is that they feel very organized. Were they planned? It seems unlikely that they would be totally spontaneous. A. Cullors: That’s because they weren’t. The uprising after Mike Brown’s murder was spontaneous. But what you’ve seen in the last month—there’s been a significant amount of organization. Alicia and I have been on the ground in Ferguson a handful of times now. The young organizers in Ferguson from Hands Up United, Lost Voices, Organization for Black Struggle, Don’t Shoot Coalition, Millennial Activists United, and the like, understand they are at war. Tef Poe, Tory Russell, Montague Simmons, Cheyenne Green, Ashley Yates, and many other young Black activists in the St. Louis area have not been waiting around for an indictment. Nor are they waiting for the much vaunted Federal probe, for they have no illusions about a federal government that provides military hardware to local police, builds prisons, kills tens of thousands by manned and unmanned planes without due process, and arms Israel in its illegal wars and occupation. They have been organizing. So have the young Chicago activists who founded We Charge Genocide and the Black Youth Project, and the Los Angeles-based youth who make up the Community Rights Campaign, and the hundreds of organizations across the country challenging everyday state violence and occupation. They remind us, not only that Black lives matter—that should be self-evident—but that resistance matters. It matters because we are still grappling with the consequences of settler colonialism, racial capitalism and patriarchy. It mattered in post-Katrina New Orleans, a key battleground in neoliberalism’s unrelenting war on working people, where Black organizers lead multiracial coalitions to resist the privatization of schools, hospitals, public transit, public housing, and dismantling public sector unions. The young people of Ferguson continue to struggle with ferocity, not just to get justice for Mike Brown or to end police misconduct but to dismantle racism once and for all, to bring down the Empire, to ultimately end war. Hell no! The time for remorse would have been when my husband was yelling to breathe. That would have been the time for him to show some type of remorse or some type of care for another human being’s life when he was screaming 11 times that he can’t breathe. So there’s nothing that him or his prayers or anything else would make me feel any different. No, I dont accept his apology. No, I could care less about his condolences. No, I could care less. He’s still working. He’s still getting a paycheck. He’s still feeding his kids, and my husband is six feet under. And I’m looking for a way to feed my kids now. Who’s gonna play Santa Claus for my grandkids this year? Cause he played Santa Claus for my grandkids. Who’s gonna do that now? The fourth time a Poughkeepsie police officer told me that my Vassar College Faculty ID could make everything OK was three years ago. I was driving down Wilbur Avenue. When the white police officer…asked if my truck was stolen, I laughed, said no, and shamefully showed him my license and my ID…The ID, which ensures that I can spend the rest of my life in a lush state park with fat fearless squirrels, surrounded by enlightened white folks who love talking about Jon Stewart, Obama, and civility…. It is understandable, though not acceptable, that Black women often find ourselves on the fringes of these conversations. Even when we are front and center it is usually to prove our fidelity to Black men and their unique struggles. Very seldom is the violence inflicted upon Black, female bodies by law enforcement positioned as pivotal to justice movements; rather our lived experiences as victims of the state tend to be peripheral and anecdotal. This invisibilizing of Black women is systemic. That uncomfortable truth is evident in President Obama’s My Brother’s Keeper initiative that leaves sisters out in the cold and equally clear in the vitriol hurled at those of us who insist that the institutionalized needs of Black women must be addressed in tandem with the needs of Black men. It becomes even more clear when Black people becomes Black men by default. 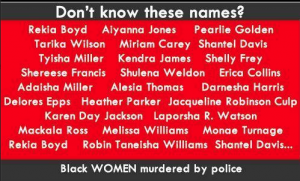 In at least one article, which blatantly cherry-picked names from “Operation Ghetto Storm,” a comprehensive report created by researcher Arlene Eisen and published by the Malcolm X Grassroots Movement, a list was compiled of 20 victims of police murder and not one woman was listed. 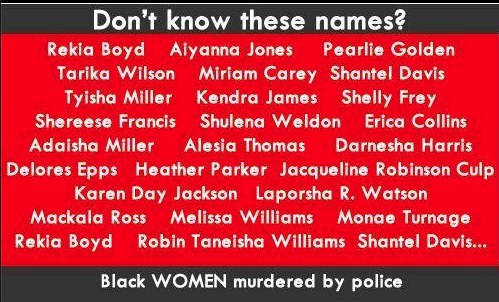 I believe the Black community’s and everyone else’s continued silence about the injustices committed against Black women and girls are purposeful acts of complicity and erasure. You ignore us on purpose. And when you do pay attention, the Black media only cares if we are THOTS, getting relaxers, wearing a weave, going natural, perpetually single or one of many baby mammas. The activists only care if we are the “help” who is marching and organizing for someone else. The Black community only cares when it needs someone to blame. I know that if I were shot dead today by the police, no one would march for me. No one would speak for me. You probably wouldn’t even know my story but it happened to my brother, who is Black, you would. I sit here knowing that my Black femaleness means that you believe I am not worthy of your collective outrage, protection and love. I know that my Black womanhood means that I am a third class citizen, in a second class community within a “first world” country. I sit here knowing that Black women and girls stories die in silence while Black men and boys stories live in your outrage. I sit here knowing that regardless of how many lists I create and how many times I post this list you want to ignore us. You need to ignore us. You do not see our humanity. I sit here knowing that I won’t stop until you pay attention to us. There is a pattern emerging in my Facebook feed this week. One group of friends has been posting stories of police brutality and protests accompanied by personal statements of outrage. Another group has been remarking on the disgusting revelations from the Senate Intelligence Committee’s CIA torture report and the need for accountability. There is little overlap between the two groups, and yet the common threads between the U.S.’ foreign and domestic policies are disturbingly uncanny. Whether it is our federal or state officials that are responsible for killings and torture at home or abroad, ultimately we fund it all through our tax dollars and sanction it all through our silence. Too many liberal activists fixate on the effects of U.S. foreign policy while ignoring what is happening on our doorstep. And too many of us who work for justice domestically overlook what is done to our brothers and sisters abroad. If we are to transform the U.S.’ approach to violence we need to draw links between right here and far away. Ferguson is Baghdad is New York is Kabul. We ain’t gonna stop ’til people are free. Since we posted this, the discussion continues, especially around the attempt to shift the controversy and blame the protesters for the shooting of the two policemen in New York. The first quoted here is from a Dani McClain’s blog in THE NATION, in which she points out that New York shooter Ismaaliyl Brinsley, Australian cafe shooter Man Haron Monis and Trayvon Martin’s killer, George Zimmerman all had a history of shooting or otherwise abusing women. What’s equally predictable and disappointing is the near-erasure of Shaneka Thompson from the story of Ismaaiyl Brinsley’s shooting spree. Thompson is the 29-year-old ex-girlfriend whose Maryland apartment Brinsley entered before shooting her in the stomach and leaving her to scream for help. S She is also the latest in a series of women who have been brutalized by men whose violence only became notable when they took on targets deemed more important, more relevant to a national or international debate already in play. But in both this [New York] case and the Sydney incident, there seem to have been assumptions that public safety was not at risk despite the allegations and evidence of violence against women. Why does the threat level and stoking of public fear skyrocket when a madman is thought to be tied to an ideology that’s generally hated in the mainstream-anti-police sentiment or Islamic fundamentalism-but not when that madness has threatened a woman’s life or safety? Ismaaiyl Brinsley, the suicidal killer, wasn’t an impassioned activist expressing political frustration, he was a troubled man who had shot his girlfriend earlier that same day. He even Instagrammed warnings of his violent intentions. None of this is the behavior of a sane man or rational activist. The protests are no more to blame for his actions than The Catcher in the Rye was for the murder of John Lennon or the movie Taxi Driver for the attempted assassination of Ronald Reagan. Those who are trying to connect the murders of the officers with the thousands of articulate and peaceful protestors across America are being deliberately misleading in a cynical and selfish effort to turn public sentiment against the protestors. S They hope to misdirect public attention and emotion in order to stop the protests and the progressive changes that have already resulted. Shaming and blaming is a lot easier than addressing legitimate claims. “Weave” on the Daily Kos points out the double standard between the response of police, politicians and media to the NYC police killings and very similar police killings in Nevada perpetrated by whites associated with Cliven Bundy. Bundy is the the Nevada rancher who allowed right wing militia members to point their guns at police trying to remove Bundy cattle from federal land. In spite of Bundy’s provocative aggression, the government chose to de-escalate that situation by backing down. Jerad and Amanda Miller left the Bundy “battlefield” and killed two Las Vegas policemen. The killers left a Gadsden flag [Don’t Tread on Me] draped over the cops bodies with a note that read “The revolution is beginning”. But the link to the Tea Party movement was also downplayed as the act of two deranged individuals who do not represent the entire Tea Party movement. … Quite the contrary, as soon as it was found that the killers were on the Bundy Battlefield, the media put distance between them, the Bundy protests and the Tea Party as well as right wing militias. Las Vegas PD did not turn their backs on Nevada Gov. Brian Sandoval and Sen. Dean Heller and other conservative politicians who publicly supported Bundy and his heavily-armed, government-hating militia.